7 Mile Trail Run FUN! So this past weekend I completed a 7-mile trail run through a beautiful wildlife refuge around the Assawomen Bay. 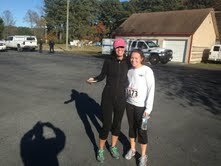 It was sponsored by a local Church and the after party is completely worth any distance that they would ask me to run! Talk about an awesome spread! Everything is homemade: roasted vegetables, at least 5 different kinds of soups, salads and holy DESSERTS! In the past I have only ran the 5k but since I am now only a few weeks away from my half marathon I figured I better get something longer than a 5 mile run in! This race, as I stated before, was 7 miles. It was a trail run so we encountered many different types of terrain. We ran on hard gravel, loose gravel, soft dirt, packed hard dirt, leaves and pine needles! We dodged tree stumps, vines and ran against the wind! It truly was a mix of elements! My goal for the race was to finish in under 1:20. A few months ago I ran the Dogfish Dash 10k in 1:07 so I figured 1:20 would be a reasonable goal for an extra mile longer. My neighbor actually ran with me and it made such a difference! I have found that running with someone else makes things SO much better and it seems to go by quicker- even if we do not say a word to each other- it is just nice knowing that someone is next to you! As you can see from the runkeeper snap shot we ended up finishing in 1:12! I was overly excited with our time! We ran a somewhat steady pace throughout and stopped to walk only at the water stops. It was beautiful to take in the views of the leaves changing and the Bay as we ran through the different “landings”. I grew up right down the road from the wildlife refuge so I always think about my Dad taking me crabbing there or our family having a picnic in one of the pavilions. It truly is a beautiful place! I used this run to complete my 5bythe5th race sponsored by @mommyrunfaster. As I was entering my time ((which is my quickest so far)) I was excited to see how much quicker each 5 miler has gotten since the one in September that I walked pushing my double stroller. In September it took me 1:35 minutes, October 56:54 and November I am down to 51:20!!!!! I am not sure what December’s time will look like but either way finishing this challenge is another accomplishment to check off on my list! Next Post #mondaynightmiles football running challenge! Incredible progress you’re making there! Seriously amazing! Sounds like you are making progress. When and where is your half marathon? Will it be your first half marathon? I am running the Annapolis 1/2! This will actually be my 7th half. The last three 1/2 marathons I have done I have been pregnant so excited to actually enjoy a post race celebration for a change!!! That sounds like so much fun!! Way to go on another virtual race down!